If I had to use one word to describe this book that word would be fun. The setting, the characters and the mystery were all very much enjoyable. This was a cute book. It has all the elements of a great Cozy, A quirky cast of characters, A charming location, knitting, and of course dogs and a cat. A Fright to the Death has a lot going for it! Besides the psychic aspect of the series, which is always a lot of fun, this book takes place in a Victorian “castle” hotel of the sort I’ve always wanted to stay in – and there’s a knitter’s conference going on at the same time. 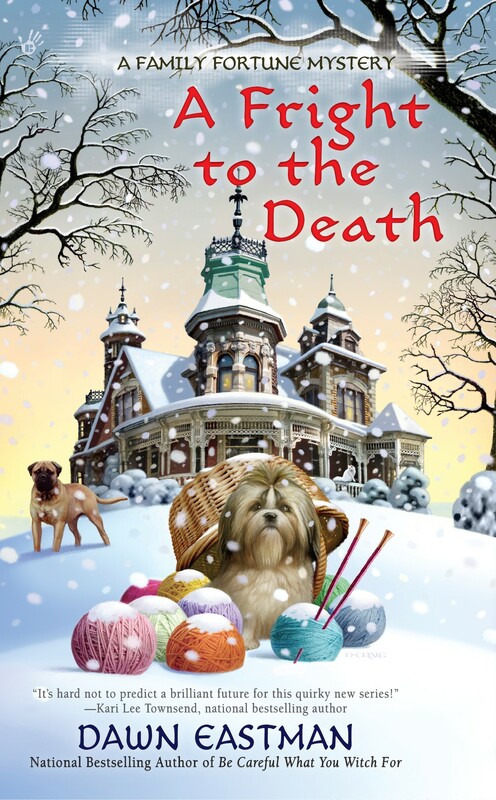 That hits four of my interests right there – knitting, mystery, Victorian architecture, and a touch of the paranormal. Small wonder that I jumped on the chance to do this tour! The characters continue to make me smile. Mac’s mom added some normality to help balance out all of Clyde’s family wackiness. This was a nice addition to the series. I am giving A Fright to Death, 5 stars. As an added bonus, I just love the covers! This was my favorite Eastman yet! … A great cozy mystery that will keep you guessing as you meet suspect after suspect, I can’t recommend this series enough. Perfect for cuddling on the couch with a cup of tea…A Fright to the Death will leave you feeling warm and satisfied and itching for the next book in the series. 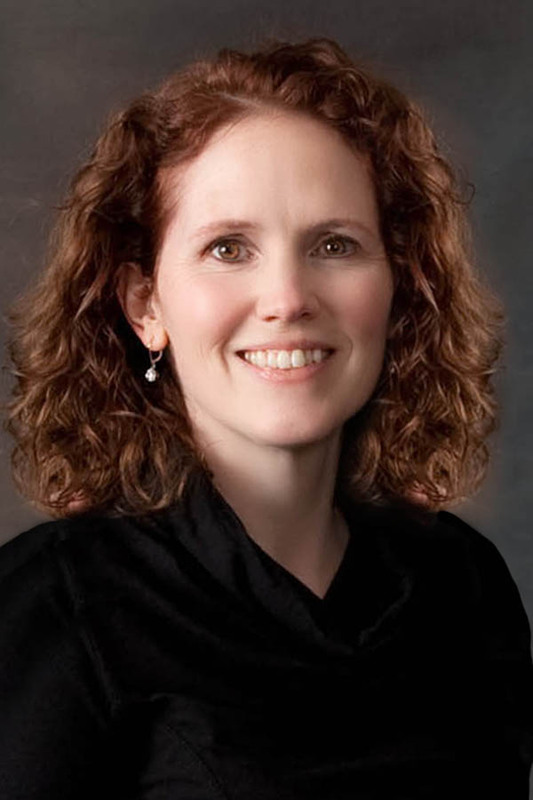 Dawn Eastman is a phenomenal writer who can draw her readers in and leave them in suspense until the very end. It is rare that an author can do that. A Fright to the Death is a hauntingly fun mystery filled with thrills and chills, that will keep you on the edge of your seat. This story is full of twists and turns and will keep you up long into the night trying to find out what happens next. Clyde was my favorite character and I loved that she had psychic abilities. 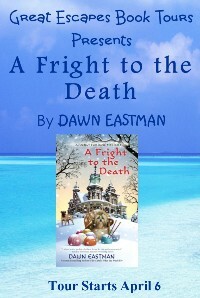 With a healthy dose of humor and an intriguing puzzle A Fright to the Death is a great read. I had a lot of fun poking around the hotel for clues, sitting in on the interviews, chilling out with the many guests, and discovering hidden passages. …loved that this is a “snowbound book,” which was fun to read as we are bidding goodbye to that nasty kind of weather. After their flight to Mexico is cancelled, Clyde and her detective boyfriend, Mac, end up snowed in with their families at a supposedly haunted hotel. Clyde’s tarot card reading mother, Rose, is making dire predictions for the weekend, and self-proclaimed pet psychic Aunt Vi is enchanted by the legend of the hotel’s ghost—until the power goes out and a body turns up. When I was ten years old, my two favorite things were climbing trees and reading. As a bonus, I discovered if I combined the two, I could hide from my mother when she wanted me to clean my room. Nancy Drew and I spent many afternoons solving crimes and avoiding chores. Eventually, I moved on to Hercule Poirot, Sherlock Holmes, and Stephanie Plum. I improved my housework-dodging ploys. After many years in Michigan, I now live in Iowa with my husband, son and daughter. When I’m not writing or chauffeuring kids, I keep busy catering to the whims of a bossy bichon-shih tzu mix who wants to rule the world.